So, yeah, thinking about it cross-linguistically, conative really isn't the term for what I'm talking about for the meaning of lu -- I think I'll have to go back to volitive. The conative would be focusing on the idea of the attempt, the effort, the trying; a useful semantic, but not what I'm going for here. I was working on my fonts for my conlang again and I starting thinking about alphabets in general, and I thought it would be fun to do a post on Tolkien's Middle Earth alphabets, Cirth and Tengwar. 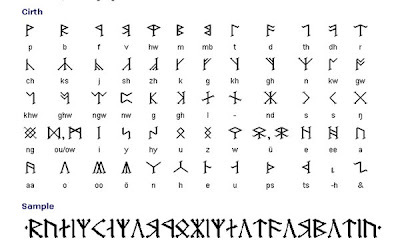 First, let's take a look at Cirth, which was used to write Khuzdul, the dwarvish language, as well as Quenya and Sindarin, the elvish languages. It was based on the Norse & Anglo-Saxon Futhark runes. There's nothing very fancy about this alphabet, it functions much the same as our own; each glyph represent one character. But note that the different letters correspond to each other in certain ways: letters that are phonetically close to each other look similar. P and B, for example. B is pretty much the "voiced" form of P (voiced means that your vocal chords are engaged and vibrating). B looks just like P but its got that extra little stroke sticking out there, making it look like an R. Same thing for T and D, and K and G. And those are just the plosives; look at F and V, S and Z, and Sh and Zh. But it goes even further than this. Some consonants are combinations of sounds, especially ch and j (t and sh make ch and d and zh, the voiced versions of t and sh, make j), and you can see the relation between these letters too. Ch looks like a combination of T and Sh, and J looks like a voiced version of Ch, having an extra stroke. Another thing I like about the alphabet is that the vowels look different from the consonants; they have different angles or combinations of strokes. I don't understand why M and N are not similar, but I don't care that much. The alphabet works as a runic, archaic form of writing. By the way, the sample at the bottom of the picture says "Balin, son of Fundin, Lord of Moria." 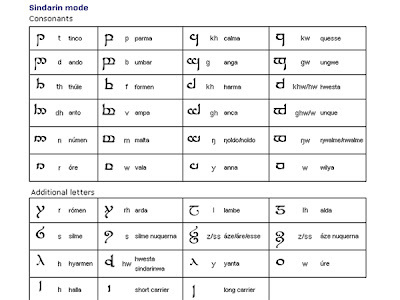 A few more notes about how this alphabet relates to language: its written the same as English, written left to right, AND the phonetic values of the letters vary for different languages in Middle Earth, just as English does, to the frustration of many people struggling to learn and speak it! Also, although it is not shown this way in the sample, words are often separated with dots. Sindarin does not have as many of the funky consonant cluster letters that Quenya has; there's actual b, d, and g sounds, for instance. The letter names are the same, they just have a different "phonetic value." Today I wanted to talk about vowels. More specifically, how vowel sounds combine. Combining vowel sounds creates diphthongs; thats the basic definition of a diphthong. But, there is another category, and its used a lot in English. Its called a “semi-vowel” and it includes letters like r, w, and y. This took me a second to wrap my head around, because I’d always thought of w and r, and, to a lesser extent, y, as consonants. But think about it- a consonant is a sound we make by impeding the flow of air through our mouths (p, m, s, b, z, even h, a little), but you’re not really putting your tongue anywhere when you make an r. You could argue that you use your lips to shape a “w” sound, but when you sound it out, its pretty obvious that w is pretty much an “oo” sound combined with whatever is before or after it (row, water, coward). So my amateur-linguist definition of a semi-vowel is: a diphthong or vowel sound that is used as a consonant. This way, the semi-vowel can technically break some of your phonology rules for vowel combination, and make the conlang feel more natural and real. So the conlang question is, do you want to make special rules about how vowels combine or don’t combine in your language? No vowel combinations? Or every syllable must have at least one consonant and vowel? I originally built Pitak to not have any diphthongs or semi-vowels, but then I was looking at Tolkien’s Sindarin language and Toki Pona, and realized I’d really like to have at least one semi-vowel in there, so I added w. As far as what languages seem to have which, I’d say that more primitive languages seem to have less combined vowel sounds, and established, evolved languages seem to have more diphthongs or semi-vowels mixed in. And further, think about whether the vowel combinations denote certain cases. Diphthongs or semi-vowels could show that a word is past tense, a command, or plural. Cool stuff. Today I wanted to talk about vowels. More specifically, how vowel sounds combine. Combining vowel sounds creates diphthongs; thats the basic definition of a diphthong. But, there is another category, and its used a lot in English. Its called a "semi-vowel" and it includes letters like r, w, and y. This took me a second to wrap my head around, because I'd always thought of w and r, and, to a lesser extent, y, as consonants. But think about it- a consonant is a sound we make by impeding the flow of air through our mouths (p, m, s, b, z, even h, a little), but you're not really putting your tongue anywhere when you make an r. You could argue that you use your lips to shape a "w" sound, but when you sound it out, its pretty obvious that w is pretty much an "oo" sound combined with whatever is before or after it (row, water, coward). So my amateur-linguist definition of a semi-vowel is: a diphthong or vowel sound that is used as a consonant. This way, the semi-vowel can technically break some of your phonology rules for vowel combination, and make the conlang feel more natural and real. So the conlang question is, do you want to make special rules about how vowels combine or don't combine in your language? No vowel combinations? Or every syllable must have at least one consonant and vowel? 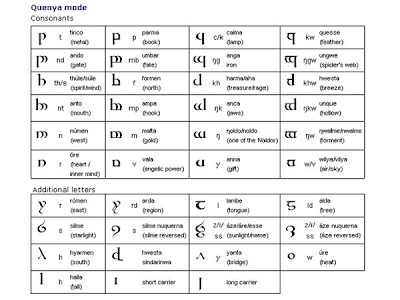 I originally built Pitak to not have any diphthongs or semi-vowels, but then I was looking at Tolkien's Sindarin language and Toki Pona, and realized I'd really like to have at least one semi-vowel in there, so I added w. As far as what languages seem to have which, I'd say that more primitive languages seem to have less combined vowel sounds, and established, evolved languages seem to have more diphthongs or semi-vowels mixed in. And further, think about whether the vowel combinations denote certain cases. Diphthongs or semi-vowels could show that a word is past tense, a command, or plural. Cool stuff. You are currently browsing the Conlangers blog archives for May, 2008.